I have three gym bags. I don’t always take them all with me. On swim days, I just take my swim bag. My swimming bag is the biggest bag I have. I bought it at the Nike outlet mall for $20. It’s big because I have to have a lot of stuff with me when I go swimming. I need shampoo, conditioner and soap for the shower afterward. I have a cosmetics bag with a hairbrush, Q-tips, Vitamin E Oil, deodorant and various lotions. The chlorine water dries my skin out and makes me itch. I use the Vitamin E oil on my body first, then put on lotion. It helps a lot. I usually stick with lotions that are unscented and aid in “itch” relief. Definitely an essential! Can’t go without my lotions and oils post-swim. I have two towels, swim suit, various swimming caps in various stages of decay (I need new ones, some are old and stretched out). I also have earplugs and noseclips for when I swim. The biggest stuff that takes the most space are my hand paddles and my buoy. I can swim without them but I like to take them with me whenever I go to the pool. So these items are essentials in my bag. Finally, I have a lock for the locker. If you aren’t locking your stuff at the gym and just trusting people to be honest–don’t. I once had my gym stolen from the gym locker. It was six months of HELL trying to get it all taken care of. Spend the $5 on a lock! SHOES. I keep my newest pair of running shoes in the bag and only use them when running or working out at the gym. I want to keep them good as long as possible and not wear them out early. My Brooks Ravenna shoes are most definitely an essential item. I can’t run in anything else! In that pair of shoes I also have the heel lift I MUST have when I run (to prevent my IT Band issues). PHONE CLIP. I have a special clip I can put on my iPhone case so I can attach it to my shorts. It’s so much easier when I workout and listen to music. I don’t have to worry about dropping my phone. BONDI BAND. I have three Bondi Bands I use when I workout or run because it keeps the sweat from dripping on my face. 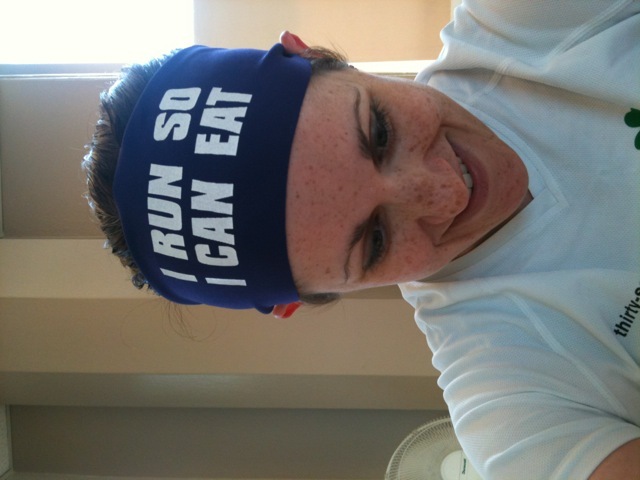 When I run outside I often switch to using a running hat. In my smaller gym bag I carry a few essential items that I need when I workout in the gym. I carry this tiny bag with me in the gym as I work out. GLOVES. The must have item is my weight lifting gloves. 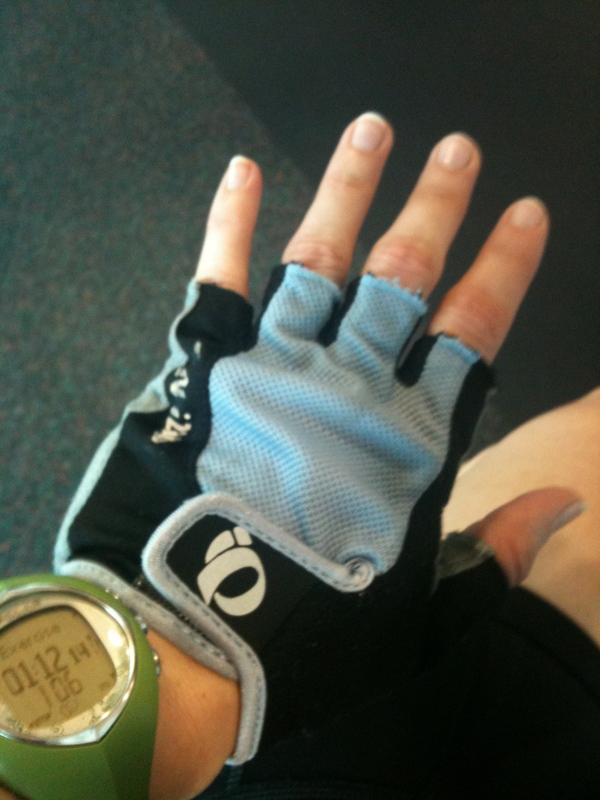 I use an old pair of cycling gloves because they are comfortable and padded. I get calluses really easily on my hands and gloves prevent that. You don’t have to spend a lot of money on weight lifting gloves, either. TOWEL. 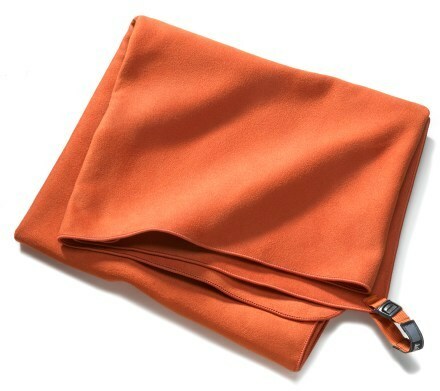 I use the REI special wicking towel. I have a small one for my gym bag and a large one for my swim bag. It’s super absorbent. It’s literally the best towel I’ve ever purchased. It dries really fast and is lightweight. I use the small one when I’m in the gym to wipe off my sweat. SNACKS. I’ve learned the hard way that I need to have some easy snacks in my gym bag. If I don’t eat them during my workout, they are handy to have right afterward. I currently have a small ziplock bag with dried apricots in it. That keeps the crashes at bay. WIPES. My gym is awful about having wipes or sprays handy to wipe down machines. I’ve started carrying my own. Yes, I’m a germa-phobe but I’d much rather buy a few packs at the Dollar Store than get sick from the gym. QUESTION: What are your gym bag essentials? That headband is FANTASTIC!!!! My gym bag essential? flip flops to wear when I shower there. The shower floors? Kinda gross! Have a great Friday Lisa! How did I forget flip flops?!?!? I most DEFINITELY have a pair in my swim bag. I NEVER walk around the pool/shower/locker rooms without them.